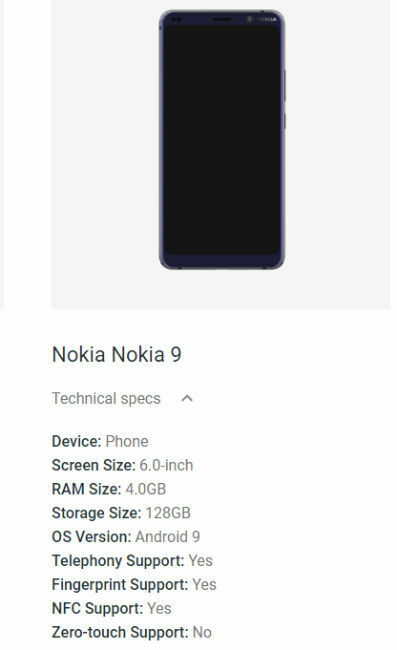 The “Nokia 9” was seen listed in the Device Catalog in the Enterprise section on Android.com showing the phone sporting 4GB RAM and 128GB local storage. 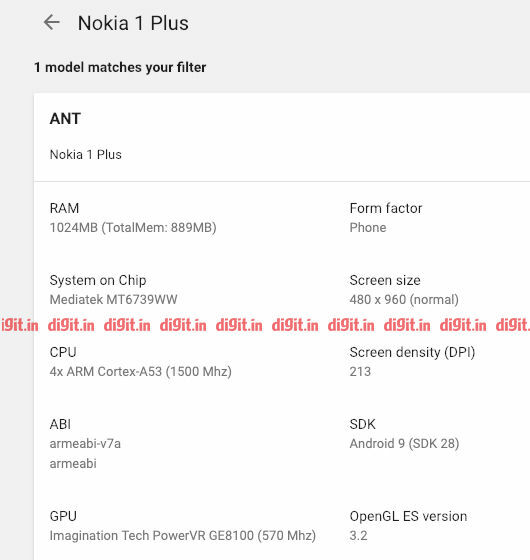 Specs of the Nokia 1 Plus have also been revealed. Listing suggests Nokia 9 PureView will have 6-inch display and it’ll run Android 9 OS. Android.com suggests the phone will feature 4GB RAM and 128GB local storage. Google Play Console listing confirms Snapdragon 845 SoC and 6GB RAM. It also confimrs that the Nokia 1 Plus will have MediaTek MT6739 processor and 1GB of RAM. HMD Global will be making an appearance at this year’s MWC and it has been highly reported that the Nokia 9 PureView will launch at an event organised by the company on February 24. 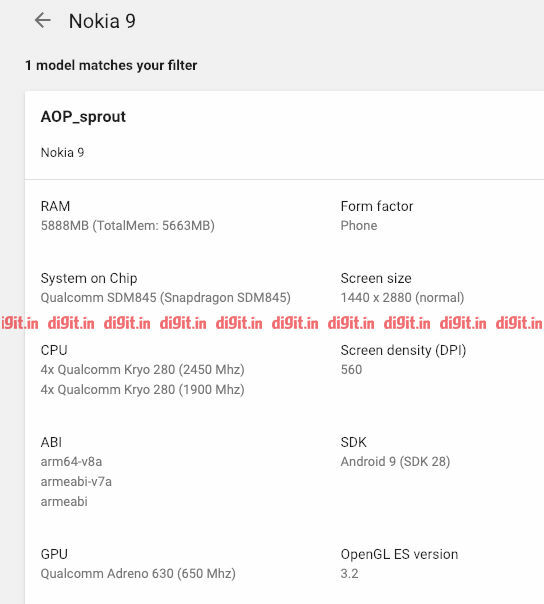 The phone has been leaked quite a few times in the past and now, the latest listing on Android.com shows some key technical specifications of the device. The Nokia 9 PureView is seen having a 6-inch display and running Android 9 Pie OS. The phone has been seen listed along with scores of other devices that run Android OS. The listing also says that the phone sports 4GB RAM and 128GB local storage. Rumours have suggested that the phone will come with 6GB RAM. Given the new listing, it's possible that the Nokia 9 could launch in two RAM variants paired with 128GB local storage. The device is also likely to come with support for NFC. The Google listing also says that the Nokia 9 will feature a “fingerprint sensor”. Live images and press renders of the phones haven’t shown any physical fingerprint sensor on the phone. It's possible that the phone will have an in-display fingerprint scanner. Could Nokia make a foldable phone and return to innovative form factors? Recently, live images of Nokia 9 PureView were leaked online. The USP of the phone is the penta-lens camera setup on the back. The camera setup is part of a hexagonal module that has seven cutouts. It has been reported that the sixth cutout is for the LED flash and the seventh one could be used for a laser-assisted autofocus tech. The Nokia 9 PureView has already got 3C Certification in China, suggesting that an 18-watt fast charger could come bundled with the phone. Since the phone has been in development for quite some time and has repeatedly missed launch schedules, it could come with a dated Qualcomm Snapdragon 845 mobile platform instead of the latest Snapdragon 855 flagship. 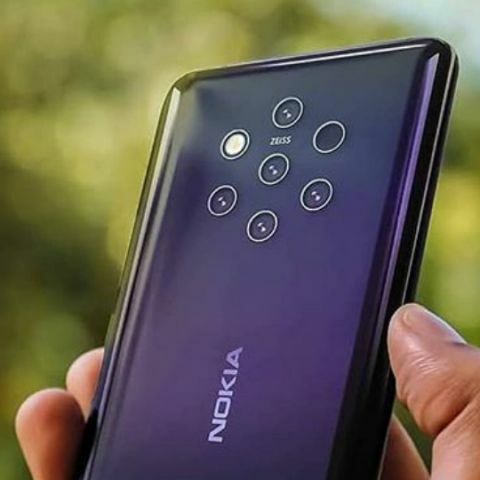 The Nokia 9 PureView is speculated to feature a 4150mAh battery and could come equipped with a display offering 2K resolution and HDR10 support.